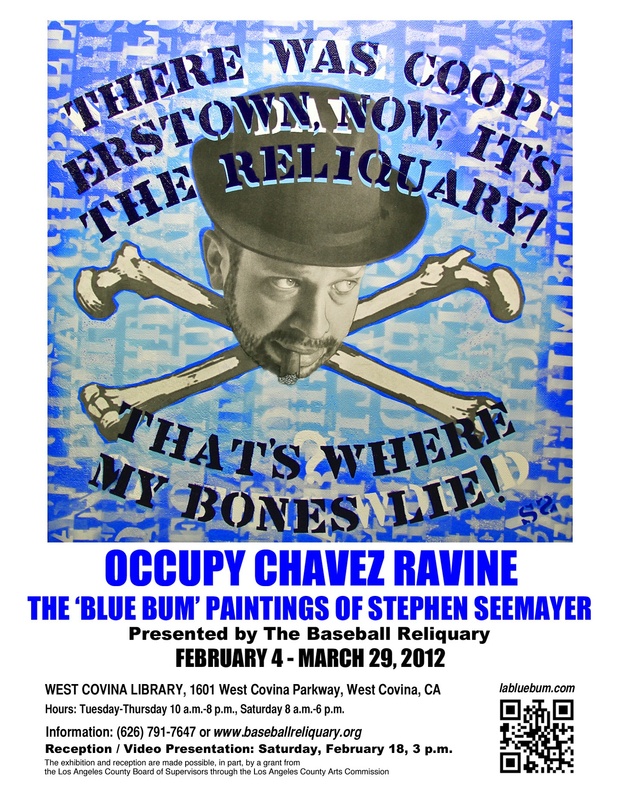 The Baseball Reliquary launches its 2012 season by presenting an exhibition, Occupy Chavez Ravine: The “Blue Bum” Paintings of Stephen Seemayer, from February 4-March 29, 2012 at the West Covina Library, 1601 West Covina Parkway, West Covina, California. For his L.A. Blue Bum series of paintings, artist Stephen Seemayer resurrected a character from the past, the Brooklyn Bum, the brilliant creation of the late sports cartoonist Willard Mullin. While working for the New York World-Telegram in the 1930s, Mullin introduced the Bum, which provided an instant identity to the Dodgers and the entire borough of Brooklyn, a symbol which would endure through times of heartbreak and triumph. A tattered tramp with a four-day growth of beard, patched clothing, and flapping soles, chewing on a cigar stub and mangling the English language, the Bum would appear in some 2,000 Willard Mullin drawings, right up to the Dodgers’ controversial departure to the West Coast in 1958. The exhibition features a selection from the 58 L.A. Blue Bum paintings, and related documentation, completed by Seemayer during the 2011 baseball season, many of which were originally displayed in his front yard in Echo Park, to be viewed by drivers and passersby on their way to Dodger Stadium. In contrast to Mullin’s often stark pen-and-ink drawings on illustration board, Seemayer’s paintings are densely layered with image and text, and utilize aerosol enamel, latex, and photo collage on masonite. The paintings can also be viewed at the artist’s Web site at http://www.labluebum.com. Stephen Seemayer is a Los Angeles-based performance artist, filmmaker, and painter. In a career spanning more than 30 years, he has been featured in performances and exhibitions at galleries and museums across the United States, including the Donnelly Gallery in Boston; WPA Gallery and Kennedy Center for the Performing Arts in Washington, D.C.; Scottsdale Center for the Arts in Scottsdale, Arizona; de Young Museum in San Francisco; San Diego State University Art Gallery; Los Angeles Institute of Contemporary Art; Los Angeles County Museum of Art; and the 18th Street Arts Complex in Santa Monica. Library hours for the exhibition are Tuesday-Thursday, 10:00 a.m.-8:00 pm; Saturday, 8:00 a.m.-6:00 p.m.; closed Monday, Friday, and Sunday. For further information, contact the Baseball Reliquary by phone at (626) 791-7647 or by e-mail at terymar@earthlink.net. For directions, phone the West Covina Library at (626) 962-3541 during library hours. The exhibition is made possible, in part, by a grant to the Baseball Reliquary from the Los Angeles County Board of Supervisors through the Los Angeles County Arts Commission. Saturday, February 18, 3:00 p.m. In conjunction with its exhibition, Occupy Chavez Ravine: The “Blue Bum” Paintings of Stephen Seemayer, the Baseball Reliquary presents a reception for the artist on Saturday, February 18, at 3:00 p.m., at the West Covina Library, 1601 West Covina Parkway, West Covina, California. Stephen Seemayer will discuss the legacy of sports cartoonist Willard Mullin, who provided inspiration for his L.A. Blue Bum series, and will introduce a screening of a video documenting all 58 Blue Bum paintings completed in 2011. The program is made possible, in part, by a grant to the Baseball Reliquary from the Los Angeles County Board of Supervisors through the Los Angeles County Arts Commission.